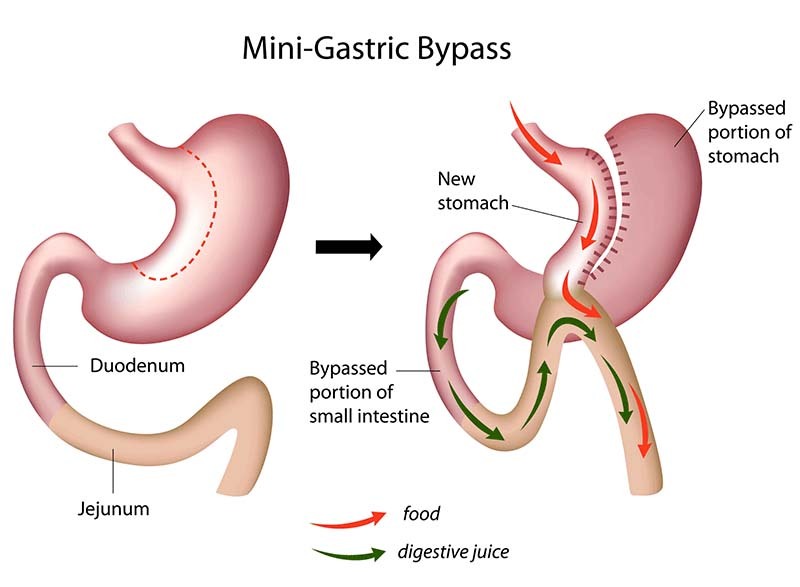 What is Mini Gastric Bypass? This is an operation where some of the stomach and part of the small intestines are bypassed. The stomach is stapled to leave a smaller pouch and then a section of the small intestine is attached (usually by staples) to the stomach pouch that has been created (see picture). The operation is done as ‘keyhole’ surgery while you are under a general anaesthetic. Having this procedure will be a tool to help you change how and what you eat. You will not be able to eat as much as before because after this type of surgery patients generally feel fuller much sooner and less hungry. This method of surgery is recommended for patients with a BMI (body mass index) of 35 and over. On average, patients tend to lose 30% of their total body weight in the first year after their surgery.